It would be difficult to overstate the amount of cultural space food has taken in the last few years. The what, where and why of food has become a new national pastime. But while star chefs have never shone brighter, there’s relatively little attention given to the people who harvest, handle, transport, prepare, and serve the food that fills our social media feeds. 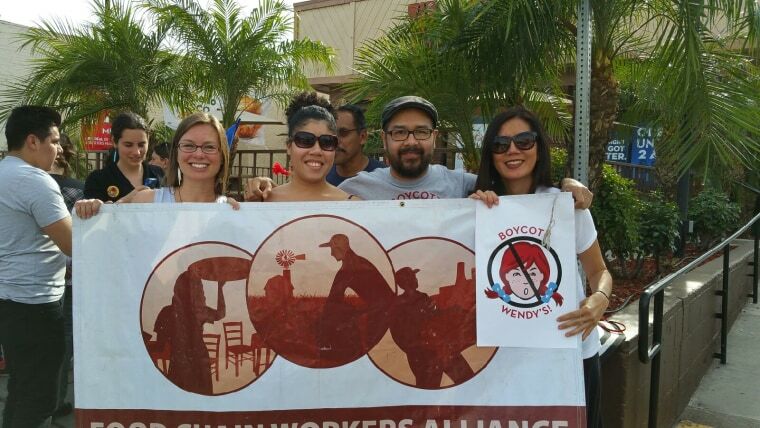 Jose Oliva, and Joann Lo, co-directors of the Food Chain Worker’s Alliance (FCWA), want to change that. The plight of restaurant workers hits close to home for Oliva who emigrated from Guatemala with his family as a child in 1985. Finding work in restaurants while studying at the University of Illinois, he witnessed abuses so common in the industry that they had become institutionalized. Oliva soon became involved with several Chicago-based and national worker organizations that tackled these problems. But it was while working with the Restaurant Opportunities Centers United, a national organization representing restaurant workers that the idea for a broader coalition began to take shape. While these issues cut across all demographics, Oliva points out that Latinos represent three-quarters of farm workers and about 30 percent of restaurant, food, meat and poultry processing workers, but they are only 17 percent of the population. Latinos' overrepresentation in the food system means both the problems plaguing the food system and possible solutions strongly impact Latino workers. In 2008, several worker organizations, including the Coalition of Immokalee Workers, Brandworkers International, Northwest Arkansas Workers’ Justice Center, and CATA, met to discuss the issues they were separately facing. The talks became the catalyst for the creation of the Food Chain Worker’s Alliance the following year. At the time, Lo was organizing garment workers in Los Angeles. Her own activism was partly inspired by her time at Yale where university employees went on strike during contract negotiations. Born in the United States to Taiwanese parents, the biology student identified with the strikers. “The workers reminded me of my parents - they were people of color, some of them were immigrants. I joined a student organization that supported the workers and their union,” remembers Lo. “I felt a passion in organizing that I didn’t feel in doing research in a lab.” Finding common cause with FCWA’s approach to the food movement, Lo became its National Director in 2009. FCWA’s member organizations range from Florida farm workers to New York street vendors to low wage and immigrant workers in the Midwest and can include local organizations with a few hundred constituents and major unions representing thousands. Participation in the FCWA allows them access to a broad national network. In 2015, member organization Familias Unidas Para La Justicia (FUJ), launched a campaign to unionize berry pickers on Sakuma Brother’s Farm, a major supplier of Driscoll’s berries. The FCWA facilitated organizing and coalition-building training for their leadership, helped plan actions outside grocery stores, and used their social media channels to promote the Driscoll’s boycott and urge supporters to join actions. This summer, FUJ and Saukuma Bros settled on a contract that includes $15 minimum wage among other benefits. In exchange, the FCWA gains invaluable insight to challenge and reform the food system on a macro-level and that already is yielding results. Last June, they successfully lobbied the Chicago Public School system to join Los Angeles, San Francisco, and Oakland in implementing the Good Food Purchasing Program. The program establishes five value-based categories - human health and nutrition, environmental sustainability, animal welfare, local economies, and valued work force - that institutions can apply when evaluating potential food suppliers. Similar campaigns are underway in cities across the country. “Public institutions - especially large ones - have market power. In the city of Chicago, it’s 90 million every year that Chicago Public Schools spend. That amount of food has an impact and it drives the entire market in a better direction,” Oliva said. In recognition of their work, Lo and Oliva jointly received the 2017 James Beard Leadership Award this summer. “It’s a recognition of the effective and impactful work of our member organizations on their own and collectively through the Alliance,” says Lo. While they’ve become involved in several high-profile campaigns, Lo and Oliva have maintained a firm grasp of why a worker-based organization that addresses the entire supply chain may be our best shot of fixing our food system. “All of our members work inside the food system. They know it from the inside out. It’s not based on a study that they read or documentary that they watched. It’s a lived experience for them,” Oliva said. “Our theory of change is that only the people who are most directly impacted are the ones who have the solutions for the problems that they are facing."